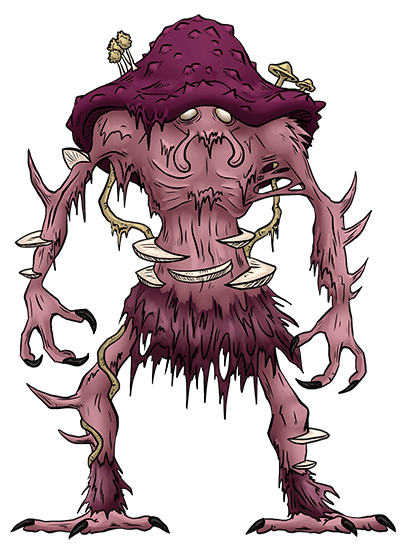 This Kreature has claws that can inject spores into a target that erupt through the flesh and rapidly break down tissue. It was initially designed as a compost kreature intended to speed up the decay of organic waste. Its touch of decay proved terrifyingly effective in combat, resulting in it being powered up and mass produced for battle. It is primarily nocturnal, spending most of the day sleeping underground, with just the top of its cap protruding. Feral specimens are found in deep, old-growth forests and in caves. Finally!! The great mushroom beast has arrived!!! I love the colors you’ve given it. I was expecting a mixture of green and brown for this one, but now I’m glad that wasn’t the case.